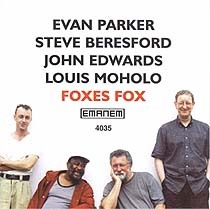 Evan Parker, soprano and tenor saxophones; Steve Beresford, piano; John Edwards, double bass; Louis Moholo, drums, cymbals, timpani, claves. Recorded on 21 July 1999 at Gateway Studios, London. Cover photograph (reproduced above) by Martin Davidson.